Description: Its naturally occurring berberine exhibits anti-biotic activity against some bacteria, protozoa, & fungi. Traditionally known as a natural anti-biotic. There are on-going studies on the long-term use and side effects of traditional pharmaceutical topical cortisones and pharmaceutical anti-biotic creams which have indicated they may lead to bacterial resistance and lack of effectiveness over time. We offer a natural alternative to these. Our product may help heal the underlying skin condition to bring your dermal layer back into balance, addressing the underlying cause, which may stimulate your own natural defences to help improve the condition more naturally. 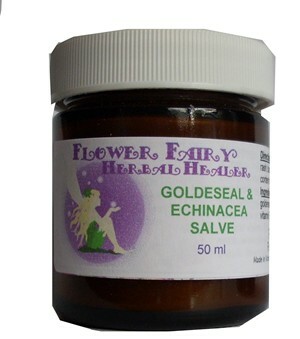 Directions: The salve is for external topical use only. Use on skin, may speed wound healing, on scratches, cuts, fungal conditions, on eczema, mild burns, herpes, abscesses, acne, ring worm, itchy skin, pimples, boils, foot fungi, herpes, razor rash, general rash, non-poisonous bug bites, abscesses, folliculitis, & topical candida. Natural anti-biotic, anti-fungal for minor infections, eczema, scrapes, bites, athlete’s foot, topical candida, & some psoriasis cases, mild shingles,cold sores & other rashes.